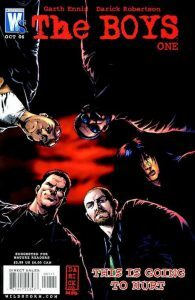 This week the 15th installment in the StashMyComics.com Podcast comes your way. The news is first up with Tim Morse, Kelly Bahoric, Matt Barrett, and Jason Martin talking about Merle’s return to the third season of The Walking Dead and Christopher Nolan’s recent appointment as an executive producer of all DC’s movies. The show then moves to reviews of The Boys #1 and Double Jumpers #1. Finally, the Weekly Distraction concerning illegally downloading of comics ends the show. Comic Book News (6:25) The gang covers new information about Merle and Christopher Nolan. 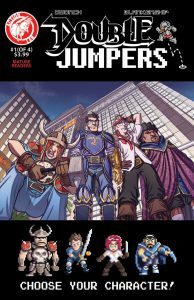 Review #1 (24:43) All four review The Boys #1.
Review #2 (33:10) Then they take a look at Double Jumpers #1 from Action Lab Entertainment. Weekly Distraction (44:21) Illegally downloading comics is the topic of the week, and everyone has an opinion on the matter. The discussion is good because I’m going insane over here. I have sooooo many ways to disagree with you in relation to Nolan and the DC movies. Keep the discussion going here! What are your opinions on Christopher Nolan taking Exec Producing roles in future DC movies? You were wondering if Nolan can do DC mythos as he is “grounded in reality”. But that’s not his modus operandi but rather, the tone of his brand. Inception is a perfect example of his ability to tale a very esoteric subject and inject enough “reality” in it so that you buy it. Above all, Nolan has a profound understanding of story telling. And he has an enormous amount of clout. He seems able to maintain an imordinate amount if creative cotrol over his projects. More than most. Those are the reasons to just sit back relax and enjoy good DC movies from here on. And when you think about it. His take on Batman was the most mythic. And his other movies play a lot with archetypes. This is Bill, The artist for Double Jumpers. Thanks for the kind review! There’s also a shot of a Samus cosplayer on the page where they leave the hotel, if you missed it. Haha! Still listening. Milo was actually based on Dwight Schrute.